*All magazine subscriptions will automatically renew. Your complete, bimonthly guide to cafe racers, classic bikes, specials, hybrids, British iron, streetfighters and other incredible, high-performance motorcycles. If it's fast and naked, you'll find it between our covers. What's Cool About It? At $7 an issue costs less than a decent shot and a beer, provides hours of enjoyment and folds easily to be carried in your hip pocket. Try that with a beer!What's In It? Each issue includes nifty regular features like Spotted Bikes, a collection of unique cafe racers from around the world; coverage of ton-up events from the British Isles from columnist Linda Wilsmore, Ton Up Tales where veteran riders from the 50s and 60s tell it like it was in their own words, along with loads of bitchin' photos, Workshop Files, our tech Q &A column with AHRMA crew chief and Race Tech suspension master Matt Wiley, How-To-Build features, Parts and Accessories Analysis, two-wheeled travel features, Road Tests of new retros, nakeds and classics, news and information about the motorcycle industry, humor, silliness and other stuff you won't find anywhere else! U.S. 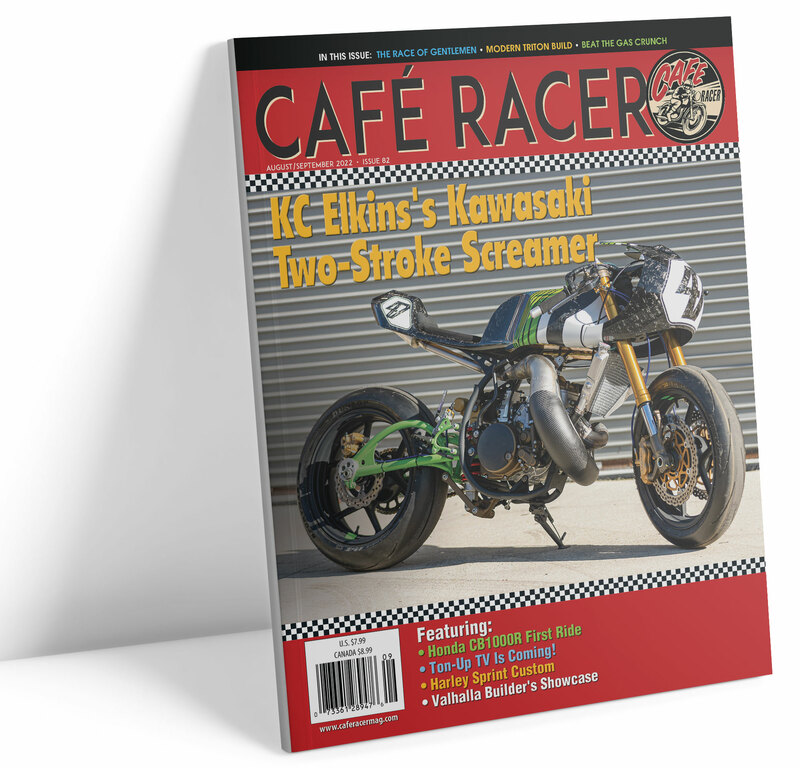 Subscribers - You can also send check or money order for $36 U.S. for six issues (post paid U.S.) or $7 plus $2 shipping for the current issue to: Cafe Racer Magazine, P.O. Box 394, Sewickley, PA. 15143. PLEASE NOTE: All subscriptions begin with the next published issue. Canadian Customers - One year subscription $48 post paid, while single issues cost just $7 plus $3 shipping and handling. UK and Overseas - subscriptions now available for just $60 U.S.Missing magazines must be reported within 21 days of shipment and/or publication on our website. We regret that magazines reported missing after that time cannot be replaced.